Some food choices can pose serious safety issues for young children and are best if you wait to offer them. If you are contemplating whether you should share your next bowl of hot buttered popcorn with your child, consider a few important factors first. Although the idea of cuddling with your toddler while watching a movie and eating popcorn may sound like a good evening, it’s better to just stick to the cuddling and movie. According to the American Academy of Pediatrics, small foods, such as popcorn, should not be offered to a child until he is at least 5 years old. Besides making a sticky or crumbled mess that spans a 30-foot radius when he’s eating, your toddler also lacks the sophisticated eating skills needed to be able to eat foods like popcorn. The AAP states that young children haven’t quite mastered the chewing and grinding motion yet, so they often try to swallow foods whole. 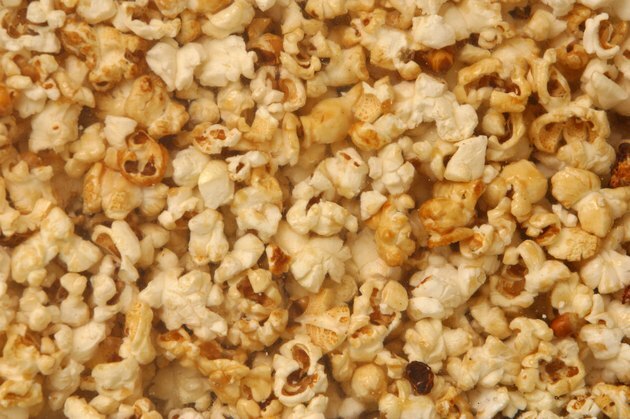 Whole or large food particles, such as popcorn, can get stuck in a young child’s windpipe. According to the New York State Department of Health, a young child’s trachea is approximately the diameter of a drinking straw. With such a small windpipe diameter, it’s easy for food to get trapped in there, preventing the child from getting the adequate oxygen he needs. Be a stickler for household and eating safety. Have your child sit while eating, regardless of what it is. Running, jumping and playing while eating all increase the choking potential dramatically. Don’t rush your child or leave him unattended when he’s eating. Show him how to thoroughly chew and swallow before talking. You can offer your child healthy food alternatives instead of popcorn, such as soft fruit cut up into small pieces or yogurt in a tube. Learning the Heimlich maneuver and taking a First Aid/CPR class will help you prepare for the unexpected, just in case.